More than 25 thousand of materials from Ukrainian newspapers, magazines and television news reports,which have come out from 1 to 28th of February 2015, were analyzed during the survey of community initiative “Restoring Donbas”. Media materials were investigated for the mentioning and context of key word’s references (“IDPs” and “refugees”), as well as the degree of usefulness for the Donbas residents, who are forced to leave the area of ​​military operations. 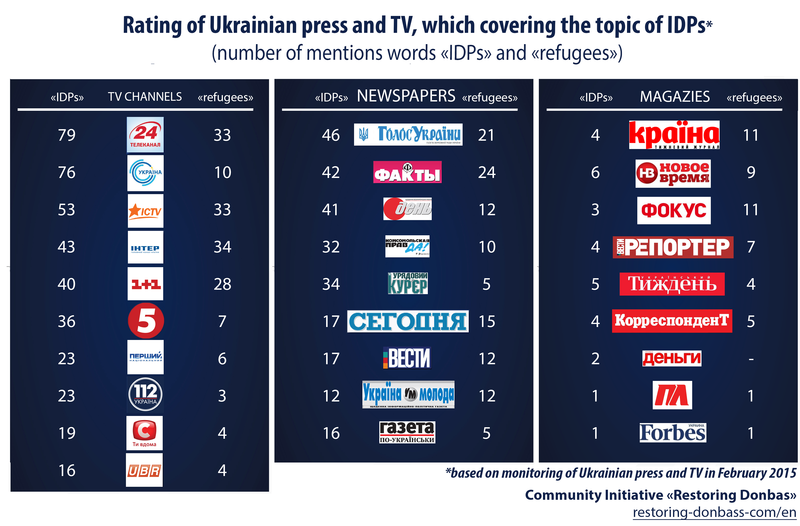 On the basis of these results it was composed a rating of Ukrainian press and TV, which cover the topics of displaced persons. In addition, there were made conclusions about key issues from the life of people in the studied media. – In February 2015, Ukrainian press and TV gave special priority to the issue of IDPs’ leaving from the area of combat operations. This is connected with the commencement of access regime in the ATO area and active hostilities in the area of Debaltsevo. Related topics were also popular – providing of humanitarian assistance to IDPs, accommodating refugees on peaceful territories. – Most frequently marked words “IDPs” and “refugees” are used by the press and TV in the context of information about the new statistics (leaving from the ATO area, unemployment, etc.). – Stories about the life of IDPs from Donbas in other regions most often are focused on two issues – finding housing and employment. – Ukrainian press and TV, in the first place those publishing houses, that are financed by the state, pay little attention to the help information that could be useful for IDPs. We are talking about contact information for obtaining humanitarian and other assistance, as well as the course of actions in each specific situation – when receiving an official IDP status, receiving humanitarian assistance, finding housing and employment. – Materials of the state media hardly covered the possibility of obtaining state assistance by IDPs (for example, formalities to receive targeted assistance). Also, there are no explanations regarding the possibility of obtaining assistance in the framework of international programs. Thus, in February, there were no materials in the state media related to issuance of UN grants to Ukraine for IDPs with the purposes of business development and reconstruction of housing. Neither conditions, nor the cases of obtaining of such grants by IDPs from Donbas were reported. – According to the survey in social networks, IDPs from the ATO area, first of all, are in need of informational support to find housing and employment, of information about obtaining humanitarian assistance. Newspapers: «Argumenty i Fakty (Ukraine)», «Business», «Vesti», «Vechernie Vesti», «Gazeta po-ukrajinki», «Golos Uktainy», «Delovaya stolica», «Den’», «Zerkalo nedeli. 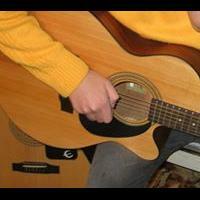 Ukraine», «Commentarii», «Komsomolskaya Pravda in Ukraine», «Segodnya», «Selskie vesti», «Trud in Ukraine», «Ukrajina moloda», «Uriadovy Courier», «Fakti i kommentarii». Magazines: «Forbes. Ukraine», «Dengi», «Correspondent», «Krajina», «Novoe vremya», «Pyblichnie ludi», «Vesti Reporter», «Ukrainian Tyzhden», «Focus». TV channels: «112 Ukraine», «24 channel», «1+1», «5 channel», «Business», «ICTV», «Inter», «Novij kanal», «STB», «ТVi», «Tonis», «Ukraine», «Pershiy natsіonalny», «Perviy delovoy», «UBR».